Regarding the geographical coverage, Electrica covers 18 counties in the country (42 counties). (approx. 36% ofthe country ~ 92.000kmp). 42% of the number of consumers of the country (~ 8 million). technology, as well as those associated with the supply/commercialization of electric power for customers. 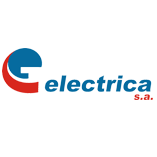 Through Electrica Serv, the field of activity is considerably expanded, with a wide range of services offered to the customers. These are maintenance services of electrical installations, designing and consulting, power equipment repairs, auto transports, commercial, related activities. SDFEE Electrica SA is involved in the implementation of some projects in the field of power generation in wind farm and photovoltaic. In the Romanian use case the energy demand and supply are matched by means of intelligent systems aiming at delivering a direct impact on overall energy consumption. Electrica will develop an innovative infrastructure with energy consumers and energy providers whose demand and supply of energy will be monitored. The aim is to reason on energy consumption and provision such that, by optimizing (reducing) the overall energy consumption a positive impact on environment can be ensured.